When the Spring came the river unmuddied itself. 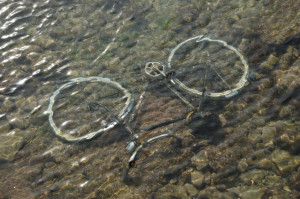 I could see the bicycle beneath the surface. I pictured the day when the owner must have wheeled it proudly home for the first time. Perhaps a gift – of movement, balance, direction. What must have flowed since to bring it to its unfathomed end?